5 times the amount of calcium that milk has. 3 times the amount of antioxidants that blueberries have. 3 times the amount of iron in spinach. 2 times the amount of fiber in oatmeal. 2 times the amount of protein of any other bean, seed or grain. 2 times the amount of potassium in a banana. They also contain more Omega3 then salmon gram for gram. The gel from the chia seed can be used to hydrate our strands as well as aid in giving our hair a healthy glow. Chia gel plus lemon juice can infuse your hair with moisture and protect your locks from dry air. Add 1/3 cup chia seeds to a resealable container and pour in 2 cups of water. Whisk well and let it sit for 5 to 10 minutes. Mix 3 Tbsp of lemon juice into the gel. Chia seed can also be used to exfoliate the skin when combined with coconut oil and lemon juice. Mix 1/2 cup coconut oil and 1 Tbsp lemon juice with 2 Tbsp chia seeds. Get these and more DIY’s on Wikihow. Tip: I like to add chia seeds to my water. I combine 2Tbsp of seeds to 1 Cup of water and let it steep for 20 minutes. It’s good for extra energy especially before starting any exercise routine. 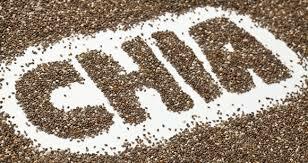 That’s why Chia Seed is known as a super-food for athletes. After looking at all the benefits of this marvelous seed, is there any doubt that this little seed would be a great addition to your daily routine? It literally works from the inside out and can be a natural and healthy substitute for products that may have unhealthy additives in them.